Pink Peonies tapestry shows gorgeous pink peonies in full bloom. Here we see the peonies in their natural green surrounds. Peonies are found in Asia, Southern Europe, and West North America. The flowers are complex, multilobed and just beautiful, and is said to represent romantic luck. The peony is also known as the King of Flowers, and is featured in many beautiful artworks of Japan and China. Here we see the pink peonies in full bloom in a garden, among its green foliage. 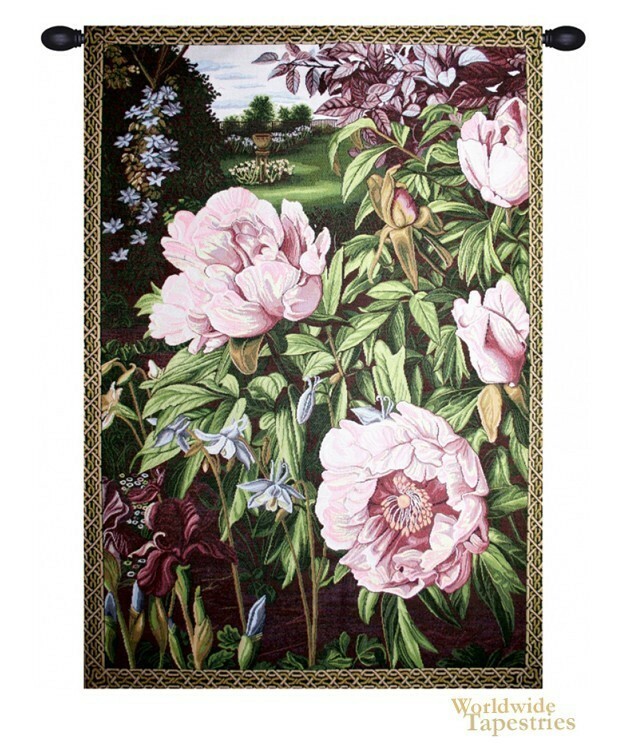 Pink Peonies tapestry is backed with lining and tunnel for easy hanging. Note: tapestry rod and tassels, where pictured, are purchased separately. Dimensions: W 24" x H 32"